No matter how successful one may be, there are always those days when nothing seems to go right. The more you do to change things, more seems to go wrong. Usually the issue stems from one small issue that pops up. As we attempt to deal with the initial issue, other numerous small problems occur, one after another, growing from one problem, into another, creating a bigger problem, leading to what is interpreted as a potential catastrophe. Associated with the cumulative problems occurring, at what seems to be all at once, and with a personal perception at the time, of no good way to stop the situation from getting worse, our stress levels begin to increase. The initial stress we feel is augmented by succeeding stress. Each new issue or problem that occurs and builds upon the others, can thrust our inner most feelings to an eruption of workplace anti-social behavior, affectionately known to your co-workers as the workplace temper tantrum. 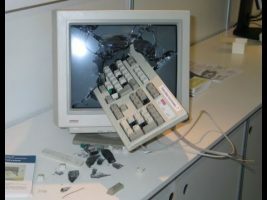 As funny as watching workplace temper tantrum videos can be, outbursts at work are no laughing matter. Workplace temper tantrums are the unfortunate result of problems that might have been known to all around, but nobody took time to find a solution to help alleviate the compounding issues. Today’s workplace is much different from our parent’s workplace. In their day, phone calls and letter writing were the norm. The slower pace allowed time for people to work on solutions for the problems that presented themselves. Being able to have time to think and discuss what to do helped keep workplace temper tantrums occur at a much lower rate than those of our modern workplace. The immediacy of the modern workplace initiates stress before you even set foot into the door of your office. Email, social media, webinars, less personnel to do more job production and a 24-7 mindset to keep in step with technology and your competitors breeds stress. Deadlines are a daily occurrence and we struggle to meet those demands. Pressure from above, demanding more, adds increasing pressures upon you, your staff and the company, business or government office as a whole. Family time becomes reduced. You stay at work longer to finish a project, or worse yet, you go home only to sit up all night to fulfil the demands of your job. Relationships suffer, your work suffers and, ultimately, your health suffers. Yet, even with workplace stress so bad, many are afraid to miss time. Afraid it may reflect negatively upon them personally, they refuse to take employee sick and vacation off. In a May 2015 Fortune.com article, “Why Americans Just Won’t Take Time Off,” Colleen Kane states, “… that doesn’t take into account the fact that when people don’t take time off to reset, their resulting stress and burnout can be detrimental to both workers and their employers”. Everyone is losing! Jenna Wolf, in her Feb 2017 article “How to Channel Anger into Action” for Tennessean.com, recognized the dilemma and how it seems to be growing, “That being said, without proper management or direction anger has the potential to keep us stuck in a perpetual rut of self-doubt and lack of momentum, leaving many of us looking in the mirror asking “well, but what do I do?” That feeling resonates in the 2000 movie, The Replacements, written by Vince McKewin. Quarterback Shane Falco states, “You’re playing and you think everything is going fine. Then one thing goes wrong. And then another. And another. You try to fight back, but the harder you fight, the deeper you sink. Until you can’t move… you can’t breathe… because you’re in over your head. Like quicksand.” We’ve all felt it. The “quicksand” feeling as we struggle as best we can to correct a situation, but no matter how hard we try, our efforts most always, seem fruitless. A 2003 Society for Human Resource Management article, by Laura Stack titled “Employees Behaving Badly” is a great resource. The article helps the reader to recognize and combat stress and what she terms as “desk rage.” It also includes a “Desk Rage Survey” indicating survey reported instances of workplace abuse, violence and damage to equipment. The solution to a bad day rests with everyone. Being able to recognize when the pressures of stress are beginning to mount against yourself and co-workers is the first step toward alleviating some of the issues which could initiate a workplace temper tantrum or worse. Use of Human Resource programs at work, can help with proactive stress reducing programs to reduce and prevent reactive situations in the workplace. Author: Chuck Wallace is a Past-President of the Washington State Emergency Management Association (WSEMA) He has an MPA and speaks throughout the country on issues related to emergency management barriers and practice. His email is [email protected].